Plastic is used to make many things in todays world. 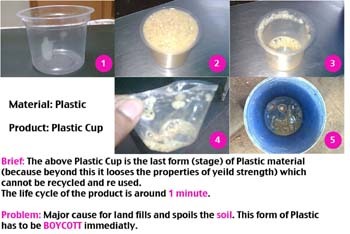 The kind of plastic used to make disposable cups is at its last stage. It can't be recycled or reused again as it loses the property of yield strength. For the one minute usage of this product it is not necessary to consume hours of energy which finally spoils the environment as it is not degradable.